A Two-Story Outhouse in Oran, IA What the people are thinking inside! 9/17/2009 My parents bought groceries at Lorbers general store for years while I was a kid. I graduated from Oran High School in 1954 and would bet most of the alumni prior have all had the opportunity at one time or another, to use this facility. I note that there were three holes in each unit. Large, Medium, and a Little one that was a bit lower, for little kids. Thus, I guess it was a 12 holer, and I believe it had a trough in the mens for the pointers! I am not sure when it went out of use, but remember a write up one time that the only other one like it was somewhere in Texas. Anyway, I can remember movies on Wednesday evenings above Vince Reiths tavern (kids admission was a dime) and would guess that some of these units had triple occupancy all at one time. 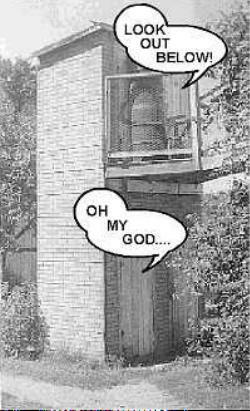 This picture was sent to me by the person who maintains the Oran, IA home page. I have included his description of the outhouse below. Feel free to visit his home page and sign his guestbook. Be sure to mention you saw the two story outhouse on the Outhouses of America Tour! The picture on the above left is the original image re-sized to fit my page. 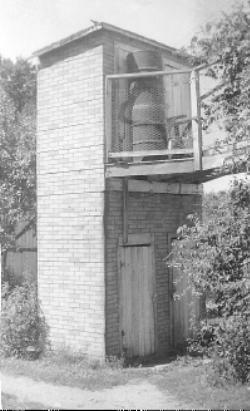 To me it looks like the two-story outhouse was detached from the rear of the two-story building and on the 2nd floor, a walkway was built to accommodate the traffic to enter the outhouse. The square frame on the walkway has a metal screen attached. It looks like there are some steel drums leaning against the left door on the second floor. It also looks like there were two doors on each level which means you could have 4 people in there at one time! I guess you could get awfully friendly with your neighbors! Sadly enough, it sounds like this one is history. Only the images on our home pages preserve its historical significance in Oran, Iowa. The image on the right was created by someone who visited the Oran home page. Within 10 minutes of Ben putting the original image on the home page, a person had downloaded it, changed it into a cartoon, and sent it back to Ben. I have included it here because I'm sure everyone who visits this page will think the same thing as the cartoon characters inside! If you're interested in a two-story outhouse, [visit] Oran, Iowa USA page. You have to scroll down the page a way to get to it, but it's clickable and you can get a larger image [The picture on his home page is shown above]. 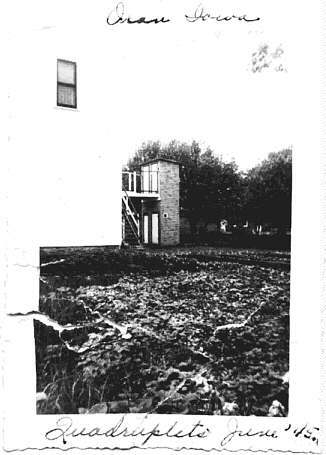 The outhouse was finally torn down, but it served two levels of an apartment building (which is still there). It had a false wall down the back side.... the occupants at the top level sat farther back! What else can you see in the photo shown? Many times a photo is worth a thousand words and I've only elaborated with a few so here is your chance to add some "color commentary" to my collection. If your addition is worthy, you will find the quote added on the Comments to the Curator page. You can use Email to respond. 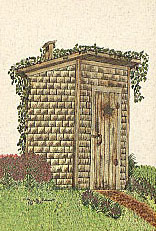 Have you seen all the Outhouses yet? Return to the Outhouse Tour by clicking HERE!